Joanie's Classy Card Corner: Fluttering by just to say Hi !! Fluttering by just to say Hi !! Hello friends, another great challenge for Through the Purple Haze and the theme is embossing, so here is my card. First though, let me say thanks for visiting and I am so glad you're here. Feel free to look around and if you have any comments or questions, please leave them in the comment section at the end. Hope I get some good love comments!! :) Okay, so here we goooooo!! I thought I would go with pastel Lavender, a relaxing color and thought the butterflies would be great for this color too, Just makes for a soft looking or feeling card. I used some Lavender and White cardstock, Recollection, from my stash. I punched two edgings, one white and one lavender and made a shadow edging. I used Spellbinder's Fleur de Lis Motifs die cut. The embossing on the white cardstock was Sizzix Dots embossing folder. 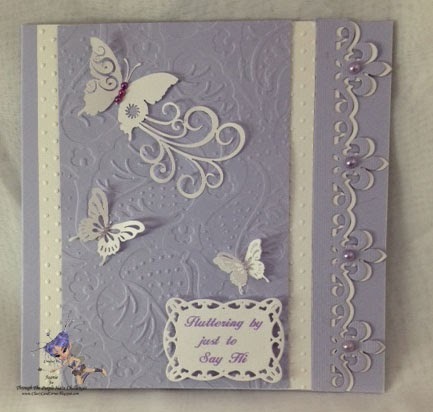 The Lavender layer was embossed with Spellbinders M-Bossibilities EL-009 folder. Butterflies, large and small, from Silhouettes files, Butterfly Flourishes, were cut on my Klic-N-Kut cutter. (*** Love this cutter. New update lets you talk to it to set cut speeds, force and lets you move the cutting blade to the position that you want. ) Hands free.. woo hoo. :0 and it does sooooooo much more!!! And finally the sentiment die cut is Spellbinders Timeless Rectangles die cut set. I added a few pearls of different sizes here and there and that completed my card. Our generous sponsor is giving away 10£ gift certificate and that is $16.45 US money.... that's an awesome prize!! Woot!! Woot!! TOTAL RELAXATION to crop the weekend away!! Hi Joanie! Gorgeous lavender card!! I love your fleur de lis border and the butterflies. That is a great embossing plate!! Love your card! What a lovely and delicate card. The butterflies are so pretty. (I love using butterflies.) Great choice on the lavender. Lovely elegant...and my fav colour.....fantastic card.